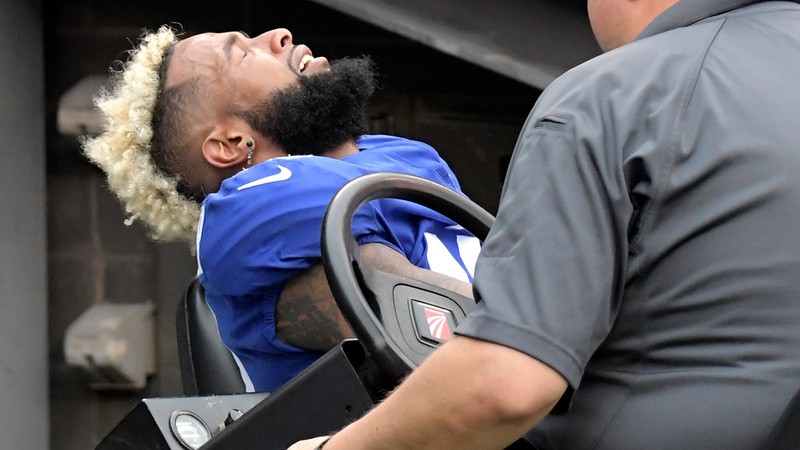 NEW YORK -- New York Giants wide receiver Odell Beckham Jr. will have season-ending surgery for his broken left ankle later this week. The winless Giants gave the update Monday, less than 24 hours after the three-time Pro Bowl receiver and the catalyst of their offense was hurt in the fourth quarter of a 27-22 loss to the Los Angeles Chargers. Giants coach Ben McAdoo spoke to Beckham after the game. He did not say what was said and he did not know if the surgery would cause any long-term problems for the 24-year-old, who has led the Giants in receiving in each of his first three seasons. "It's a sad situation," McAdoo said. Beckham was the last of four Giants' receivers knocked out of the game. Dwayne Harris, who also returns punts and kickoffs, will have surgery Tuesday for a broken foot. Brandon Marshall and Sterling Shepard were hurt on the same series in the second quarter. Marshall was undergoing further testing and examination Monday. Shepard is listed day to day. McAdoo said the Giants have not finalized any roster moves but he said that re-signing Tavarres King, who was released early in the season, and signing Travis Rudolph off the practice squad were pretty good options. He said there are no plans at this point to re-sign fan favorite Victor Cruz, who was released after last season. Beckham had 25 catches for 302 yards and three touchdowns this season, including a 48-yarder in the fourth quarter Sunday. He also had two 15-yard catches that set up Eli Manning's 29-yard touchdown toss to Roger Lewis, Jr. in the third quarter. It has been a frustrating season for Beckham. He sprained his left ankle in a preseason game on Aug. 21, missed the season opener at Dallas and was limited against Detroit. He also was fined for pretending to urinate like a dog after a TD catch in Philadelphia on Sept. 24.